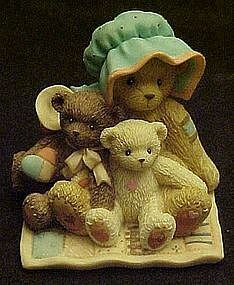 Cherished Teddies It's Moments Like These That Are Meant To Be Cherished, Mom and kids figurine.The warm family group is the 2002 Cherished Teddies figurine for Mother's Day - Sunday, May 11, 2002. Introduced: 2002 and Retired: May 2002 Measures 3.25". Comes in the original packaging and box with paperwork. Taken briefly from the box to photograph.